Wow! How often do you see something like this? 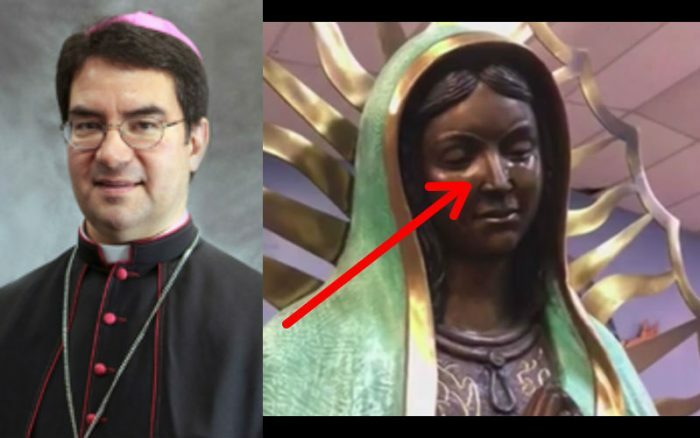 Earlier this year in May, we reported about the statue of Our Lady of Guadalupe in Hobbs, New Mexico that was allegedly miraculously crying tears that smelled like roses (see video of a local news report below). The local parish priest told reporters that he had contacted his bishop right away, who in turn said they would pursue an investigation. “As a prelude to this report, I wish to say a word about revelation from God. The Catholic Church recognizes an important difference between public revelation and private revelation. Public revelation includes Scripture and Tradition. As Catholics, these two are the bedrock of our faith, and it is the Magisterium (bishops in union with the pope) that is the authentic interpreter of revelation. Private revelations include apparitions and messages of Mary, the saints, or of Jesus himself that have occurred after the death of the last apostle. With the death of the last Apostle public revelation ceased. While Catholics are obliged to hold to the teachings of the public revelation, we are not morally obligated to believe private revelations. No new information regarding our salvation is to be gained from private revelations. The messages of private revelations only reaffirm and highlight what Christ has already revealed in Scripture and Tradition. Thus, Mary and the saints always lead us back to Jesus and to the Church. This is why Mary instructed St. Juan Diego, “go to the bishop,” and “build a temple.” While miracles have occurred in the history of the Church, they always lead us back to the fundamentals of our faith: the Church, the sacraments, prayer, and confession. “On Sunday the Solemnity of Pentecost, the statue of Our Lady of Guadalupe appeared to be crying. Parishioners observed liquid emitting from the eyes of bronze statue. The liquid was reported to have emitted three times: on Sunday, the Solemnity of Pentecost; on Monday (the next day), the Feast of Mary, Mother of the Church; and on Saturday, the Feast of the Immaculate Heart of Mary. “Fr. Jose Segura, the pastor of Our Lady of Guadalupe Parish, called me immediately to report what he and parishioners were observing. He sent me video of the occurrences. I subsequently asked our chancellor, Fr. Enrique Lopez, and vice chancellor, Deacon Jim Winder, to initiate an investigation. They traveled to Hobbs, physically examined the statue, collected samples of the liquid emitted from the statue, and began to gather verbal and written testimony from eye-witnesses. The company that fabricated the statue was interviewed. “I wish to thank Fr. Segura, the parish staff, and the parishioners of Our Lady of Guadalupe for their prayerful disposition and hospitality to visitors in the face of such an unexpected occurrence. I will plan a visit to the parish before I leave for San Jose, so as to pray and celebrate the Eucharist with the parish community.